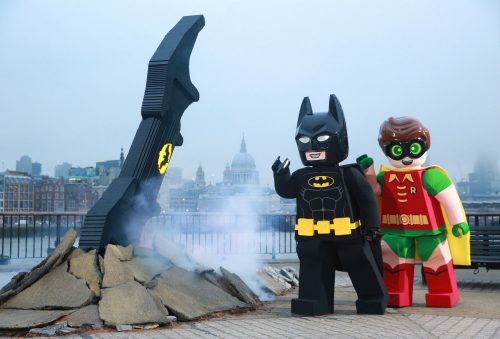 A dynamic LEGO® installation has crash-landed onto London’s South Bank today, dramatically marking the arrival of the highly anticipated The LEGO® Batman Movie, released in UK cinemas this Friday from Warner Bros. Pictures, Warner Animation Group and LEGO Systems A/S. Standing over three metres tall and destroying everything in its path, the LEGO Batarang brings to life one of the most iconic inventions on Batman’s famed utility belt. It consists of 35,000 LEGO pieces and is 133 times the size of the LEGO piece it is based on. The structure, which is live at Observation Point for two days, was built by LEGO® design company Bright Bricks and combines the impressive LEGO elements with lighting, broken ground effect and smoking rubble for a truly dynamic effect. The Batarang is accompanied by the iconic black and yellow Bat symbol, consisting of a further 10,000 LEGO bricks. Both structures were unveiled by Titmarsh, who was joined by Batman, Robin and Batgirl costume characters who met fans and posed for selfies. The installation is live between 8am Wednesday 8th February to 8pm Thursday 9th February at Observation Point, Southbank, 58–72 Upper Ground, Gabriel’s Wharf, London, SE1 9LT. It is free to visit. The LEGO Batman Movie stars Will Arnett, Zach Galifianakis, Michael Cera, Rosario Dawson and Ralph Fiennes. In the irreverent spirit of fun that made The LEGO Movie a worldwide phenomenon, the self-described leading man of that ensemble – LEGO Batman – stars in his own big-screen adventure. But there are big changes brewing in Gotham, and if he wants to save the city from The Joker’s hostile takeover, Batman may have to drop the lone vigilante thing, try to work with others and maybe, just maybe, learn to lighten up.